I have been planning and leading worship in a full-time capacity for just over eighteen years. It is an honor and a privilege. Personally, I want to steward my planning and my leading well so that in worship our people are bringing honor and glory to God; connecting with one another as the body of Christ; and understanding and engaging with their own personal lives, desiring to love God with all their heart, soul, mind and strength. It is my hope that this post will offer a paradigm for those who lead and plan worship each week - those who steward the story God is writing in the local church. In my book The Art of Worship: Opening Our Eyes to the Beauty of the Gospel, I described a triad that deals with the various roles of the worship leader. I discussed how a worship leader should be able to think like a theologian, labor like an artist, and shepherd like a pastor. As I lead seminars and workshops with churches or at conferences, I often share another triad as I discuss a philosophy of worship that includes leadership, theology, and context. In recent years I have begun to articulate a new triad that guides some of the various aspects of worship. In this paradigm I see the role of worship leaders and worship planners as Storytellers, and on any given Sunday there are three stories to tell: God's Story, Our Story, and My Story. Building upon Frame's perspectives, God's Story would be the normative perspective of this paradigm, focusing on the events of the life of Christ and the coming of the Holy Spirit as past, present, and future realities. Our Story is the situational perspective that declares and processes what God is doing among us in our local context and congregation. Finally, My Story is the unique way in which God at work in each of our personal lives, bringing about sanctification, healing, and restoration. There is an old Latin phrase championed by our Anglican brothers and sisters, lex orandi lex credendi. It is loosely translated as "the law of praying is the law of believing," or that "it is liturgy which leads to theology." Whatever your particular view of this phrase may be, it is true that the scriptures we read, the songs we sing, and the prayers we pray are all highly formative, shaping our faith and our beliefs. Thus, as worship leaders and worship planners, we need to make sure we are serving our people and stewarding our times of corporate worship well. I want to take some time in this post to unpack this particular triad (God's Story, Our Story, My Story) and offer some reasons why it brings balance and richness to our worship services. The image at the beginning of this post is by Rini Simon, a young adult and artist at our church. It is an ink drawing which depicts the life of Christ - his role in creation, his birth, crucifixion, resurrection, ascension, sending of the Holy Spirit, and future return and reign. This is the heart of God's Story. In worship we remember, recall, and appropriate these events and realities. We do this, in part, by following the cycles and seasons of the Christian year. 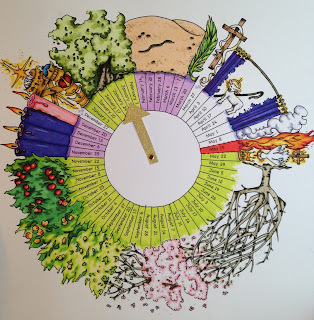 This liturgical calendar was created by my artist friend Barbara Lyon. 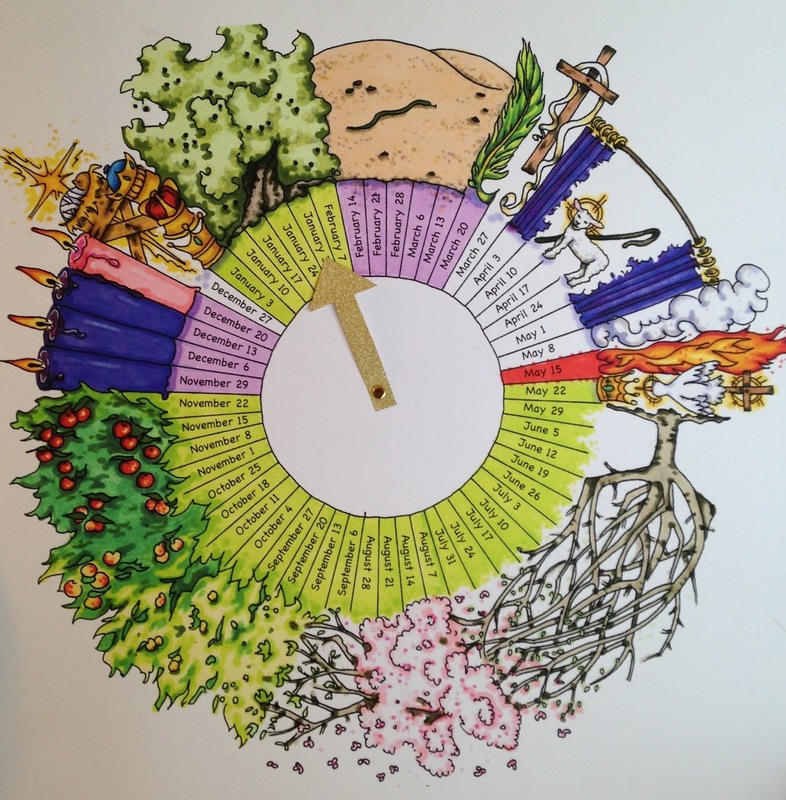 It is a wonderful and creative way to visualize the seasons of the Christian year. Though it is definitely the forgotten festival among many evangelicals, many congregations recognize the Ascension (either on a Thursday or the following Sunday) and the reality that Christ is now at the right hand of the Father interceding and advocating for his people. We remember the day of Pentecost, celebrating the coming of the Holy Spirit in power to the church. Pentecost is a time to remember the third person of the Trinity who empowers, comforts, fills, and guides us, the people of God. In hopes of gaining a more robust celebration of both Ascension and Pentecost at my current church in Florida, I issued a Call to Artists on the theme, God Is For Us: The Ascension and the Outpouring. Once the deadline for submission arrived, we had just over a dozen artists who participated and twenty different works that were on display for the two weekends of Ascension and Pentecost in May of 2016. The exhibit exceeded my expectations and was a successful event for our congregation through the means of community and creativity. In addition to these kind of events, I have also utilized many of the Lectionary-based resources available through books, journals, and liturgical planning calendars. I have found it creative and edifying to incorporate Lectionary readings and prayers within the flow of a worship service. Utilizing these resources throughout the Christian year is a way to tell God's Story and offer our people a healthy diet of Word and prayer. In remembering these cycles and seasons, we tell the whole Gospel story, stirring our hearts, minds, and imaginations around the realities of our triune God. We are heeding the call to "let the message about Christ, in all its richness" fill our lives (Colossians 3:16). We can celebrate the various wins in our congregation - the places where we see God at work, bringing his kingdom through the different ministry areas of our church, both inside and outside of our walls. One particular expression of Our Story that I believe our church is enjoying is focusing a portion of the service (about once a month) on the historic "Prayers of the People." The way I have led this recently is to guide our people through a litany of prayers for the church, the world, our community, and loved ones. I utilize a printed prayer from the journal Call to Worship (Lectionary Aids Volume) and guide us through these petitions while leaving room for pause, silent prayers, and extemporaneous prayers as well. I believe this is helping our congregation think beyond just our own personal lives and consumeristic tendencies and is giving us eyes to a bigger story that includes global and local concerns, a heart for the city and for the kingdom of God. Again, going back to the idea of lex orandi lex credendi, the things we pray together in worship help form and shape our perspective and our worldview. God is writing a unique story in every local church. We don't need to feel like we have to compete with the mega church down the street, or the hip church across town, or even the church in a different region of the country that just hosted a slick, national conference. It is not healthy to try to reproduce the story God is writing somewhere else. We should be concerned and engaged with the story God is writing in our local context and congregation. Part of our corporate worship should incorporate recognizing, celebrating, and telling our unique story. When our congregation hears us describing our failures as well as our victories, I truly believe we are building genuine trust and relational capital with our people. We shouldn't come across as ministry professionals who have everything all together. We should convey, humbly and wisely, some of the ways we wrestle with fear, shame, pride, and self-centeredness. We, too, are in a progressive journey of sanctification. Usually, for me, I try to refrain from sharing something personal and transparent every week; however, I do seek to regularly share from my heart about something real in my everyday life. This may come as I transition from the sermon into the closing song; it may be a brief word before leading into a prayer of confession or renewal; or it may be as I'm responding to a song we just sang or a creed we just professed together. There is no particular formula, but I do try to listen to and follow the Spirit's leading as well as my own intuition. I am so grateful for the decision I made eighteen years ago to serve as a worship leader in the local church. Though she is flawed, she is the hope of the world. I count it a privilege to plan and lead worship each week - to tell God's Story, to celebrate Our Story, and to share a bit of My Story with the body of Christ.